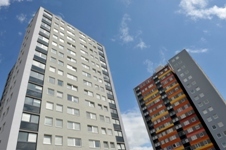 The London Borough of Barking and Dagenham recently carried out a major retrofit of two tower blocks to improve them in line with Decent Homes guidelines. As part of the project LBBD received a grant from the Greater London Authority to include a range of climate change adaptation (and mitigation) features. The retrofit used London Climate Change Partnership’s guidance Your Home in a Changing Climate as the blueprint for the adaptation features within the retrofit. This is the first time that the guidance has been used for such a large scale project. In addition to the high specification of climate change measures, the retrofit was ambitious because the extensive and intensive work occurred whilst the residents were in situ. Because there is a great deal of housing stock of a similar age and type in this country, LCCP are producing a findings and recommendations report to learn as much as possible from this project – highlighting the most successful aspects of the work, lessons learnt, cost-benefit and scalability. The evaluation report was published in January 2013 – download Your social housing in a changing climate.